When it comes to interior design, Indians have always shied away from dark, inky tones. 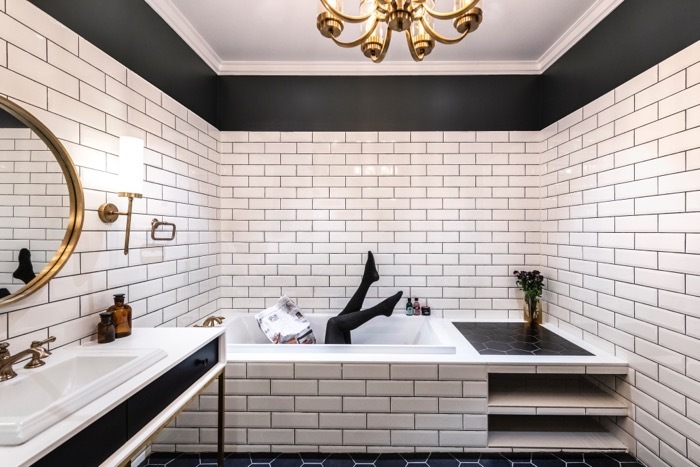 From buying into the fallacy that they make spaces look smaller, to yoking them with a sense of taboo, we’ve confined dark tones to small doses in the past. Fortunately, however, millennial designers are looking past the archaic misconceptions surrounding these authoritative hues, and are steadily ushering them into the mainstream. 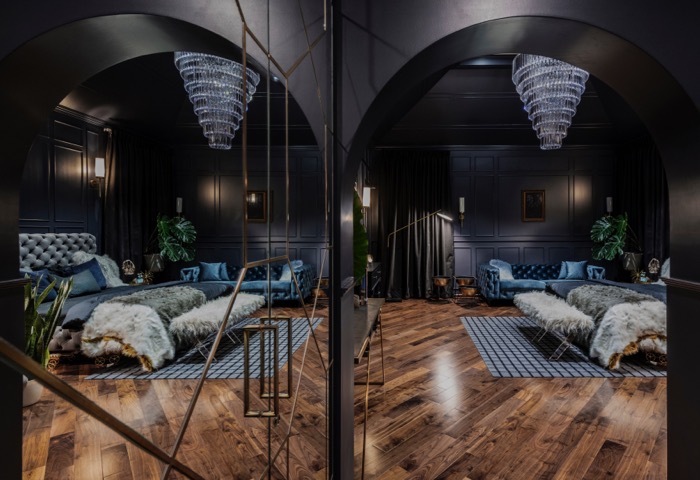 One such design duo, Mohammed Afnan & Arun Shekar of Humming Tree took it upon themselves to champion dark tones in their design for a swanky bachelor pad. Seeing as the bedroom is a space generally associated with relaxation, the colours linked with its interior are usually pastels, neutrals and soft shades. Dismissing this view, the Kerala-based duo went on to adopt a colour palette comprising black and other inky hues. 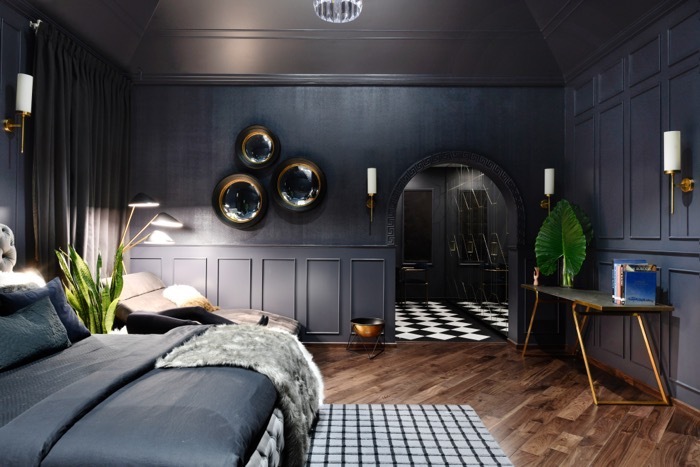 The walls throughout are a matted black tinted with Prussian blue colour, featuring sleek mouldings. The flooring comprises wooden planks that are placed at an angle. 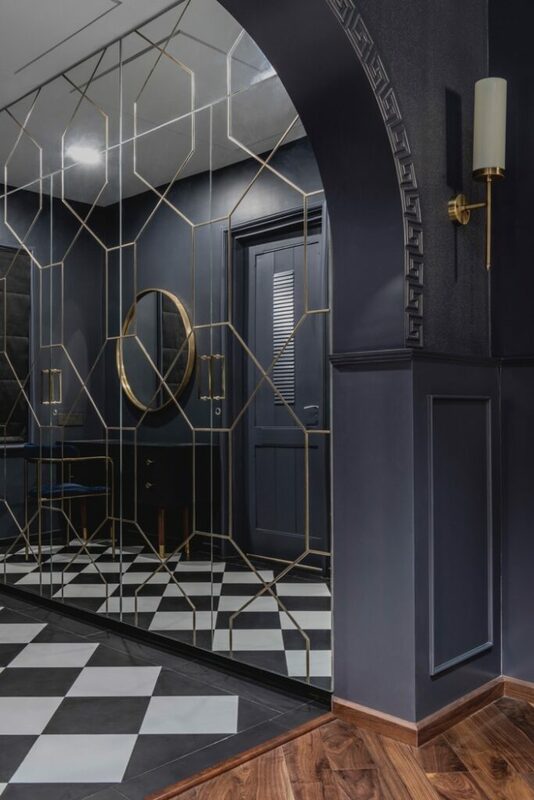 The overall design of the space sees several Art Deco influences, from the dark colours to the brass accents and elements of black and white in the flooring. Velvet has been used liberally across the soft furnishings, one of the most marked examples being the royal blue tufted sofa from Kare. 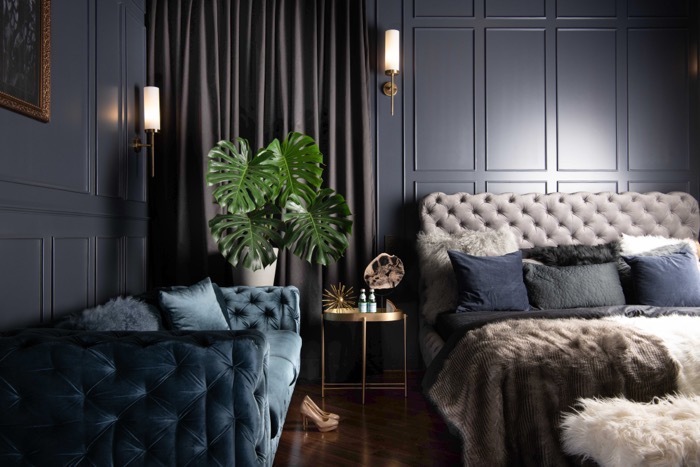 The inky black curtain, grey rug and white fur footbed add welcome elements of variation in terms of colour and material. Art Deco inspired crystal plates and a Midcentury Danish Floor lamp was sourced from the San Francisco Antiques Show. This spirit of luxury continues inward, resonating throughout the walk-in wardrobe. The black and white chequered flooring and gilded mirror shutters fully reflect the opulent sensibilities of the period. A white ceiling draws attention to the double height of the space while adding a striking contrast to the dark walls. 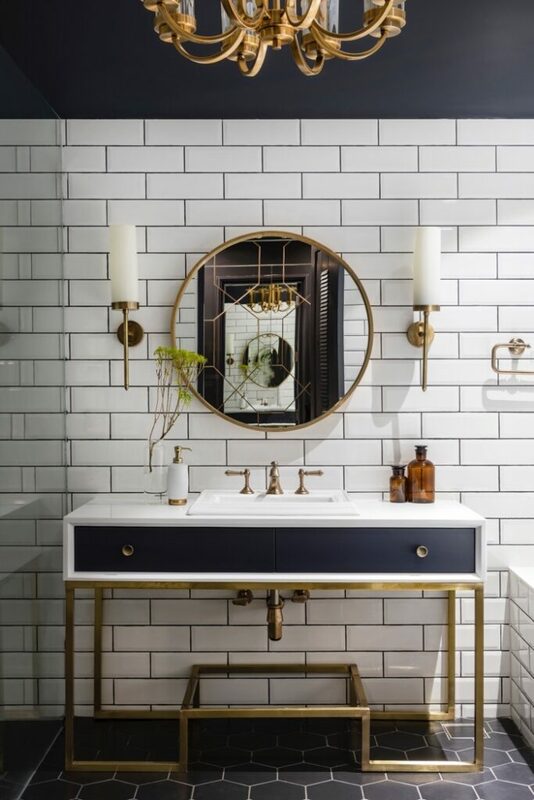 Further committing to the aesthetic, the bathroom features stunning white brick tiled walls with matching elements of brass and black. A difference in colour, shape and finish between the two types of tiles adds a welcome variation. The wall-mounted brass lights match the ones in the bedroom, while a vintage brass chandelier completes the look. Another interesting aspect to note was the full complement of technology integrated into the design of the pad. 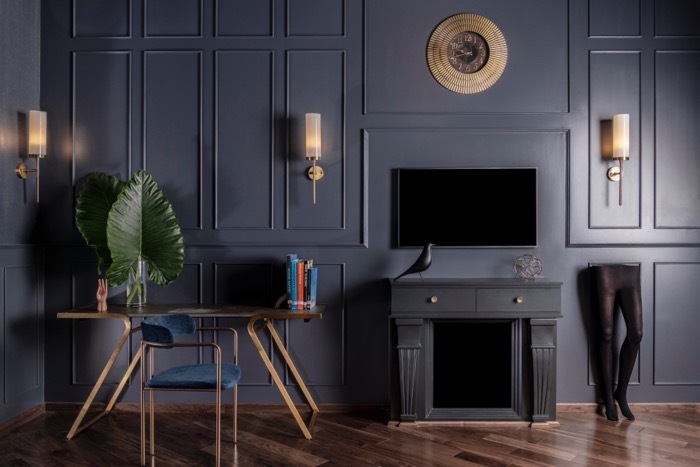 While the lookalike fireplace could merely be chalked up to an interesting design element, it serves a utilitarian purpose of concealing the flat screen TV’s cords. This seamless incorporation of technology into the space completed the look for a quintessential bachelor pad. Photograph Credit Justin Sebastian Photography.